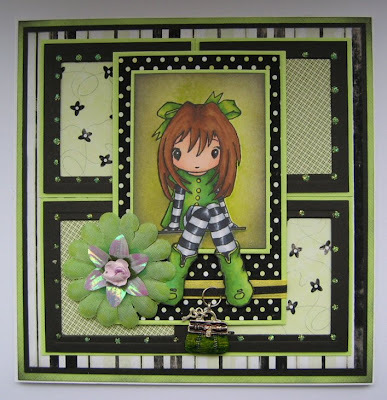 This weeks card is another birthday card for a work colleague who loves green and handbags. I have used last weeks sketch over at Midnight Madness and had intended of entering it into the challenge but missed it because I didn't have time to do any blogging. Everything about this card was a challenge for me. I couldn't get the sketch to look how I wanted it to even though it should have been easy. I coloured the image in easy enough using my copics only to find I didn't have any green patterned papers that would match. Luckily, after trawling the internet I came across some free papers on the Shabby Princess website that were perfect. 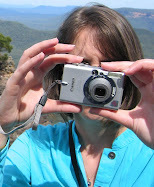 Check out the website here as there are lots of freebie papers besides paper kits to buy. You just download and print. 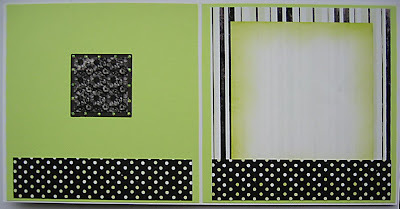 I cut out square frames to cover over each pattern and went dotty using stickles green. It's finished off with a flower, ribbon and a handbag charm.